← New Product Pages Make Searching Zuma’s Website Even Easier! Refer a New Customer to Zuma and be entered to WIN…plus get 10% Off! Refer a fellow business or friend to place an order with Zuma. To enter, when ordering they must type Your Name and the term “Refer a Friend” in the Special Instructions Block at the bottom of the Checkout Page. This enters both you and the new customer into the drawing for a FREE Keurig® Coffee Maker. You win no matter what! All customers who refer a friend will receive an email for 10% off your next order, maximum discount $20. The number of people who refer friends on promotions is generally low. We expect to get a handful of referrals, so your odds of winning are REALLY HIGH! 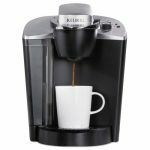 This Keurig® OfficePRO K145 Brewing System can be yours! Start telling your friends today. Entries are accepted from June 1 to June 30, 2016. The “New Customer” must be a verified new shopper with ZumaOffice.com. Orders by customers/locations who have purchased from Zuma in the past will not qualify. You may enter multiple times. Refer 5 friends and get 5 entries. Drawing will be held in early July, and free brewer will be delivered by July 31, 2016! The Keurig® OfficePRO K145 Brewing System brews a perfect cup of coffee, tea, hot cocoa or iced beverages in under a minute. With the choice of three cup sizes, you can brew the beverage you love at the touch of a button! The Keurig® OfficePRO K145 has a list price of $217.50, and Zuma has it on sell now for $119.97. It can be yours free simply by referring a friend to Zuma. This entry was posted in Office Supplies Shopping Tips and tagged coffee supplies, keurig k-cups, office supplies, Zuma Office. Bookmark the permalink.